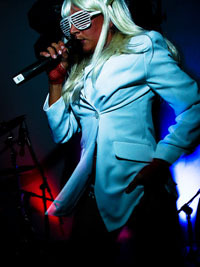 Top International Lady GaGa Tribute Act - Lady G Show by Gemma Rose. THE most authentic and exciting Lady Gaga tribute show you will find anywhere in the world. Absolutely not to be missed - a captivating and incredibly entertaining tribute to one of the greatest performers of all time. Featuring the exceptional Gemma Rose, what sets her apart from the competition is she can sing just like GaGa, 100% live AND dance to a professional level and indeed has danced on several MTV music videos. Captivating audiences with her choreographed dance routines just like the originals and dressed in stunning replica outfits you will think the real Lady GaGa is in the Haus! There's even live piano if space allows. So Put your Paws up Monsters! Lady GaGa burst onto the music scene in August 2008 with the release of the Fame album and has since picked up 54 music industry awards including 3 Brit Awards and 2 Grammys. The Born this Way album is breaking records as the fastest selling album of all time. She is also the first artist to ever get 10,000,000 YouTube followers and more recently 10,000,000 twitter followers. Read more in our Lady GaGa Biography. Numerous Lady Gaga Tribute acts have tried to emulate her but until now, few have succeeded. In summary then why should you book this Lady GaGa Tribute? THE SINGING - An amazingly talented professional vocalist for all of her adult life, Gem has perfected her tribute to her idol to perfection with 100% LIVE VOCALS. THE LOOK - Gem looks uncannily like Lady GaGa on stage with her painstakingly handmade costumes and of course those monster shades! THE DANCING - Gem has trained in dance since the age of 4, is a qualified dance teacher / choreographer and has danced for 911 and Jamelia. THE BODY - There are not many Lady GaGa Tribute Acts that dare to wear the most revealing of her outfits but with Gem's super fit dancers body there's no holding back! Lady G and her dancers appeared at Barcelona Gay Pride with over 10,000 people and it was amazing!!! On 2nd July last year Lady G and her 2 resident dancers supported the Lightning Seeds ( best known for their 90s hit "Oh Lucky You") at the Kings Lynn Festival Too in front of a crowd of 10,000 people - our biggest show yet! Lady G has performed in Turkey, Holland, Switzerland, The Lebanon, Dubai, Oman and Pakistan to thousands of happy little monsters...This year she has performed in the south of France and in Barcelona for the massive Gay Pride event. This great Lady GaGa Tribute show is available throughout England including the south, the south west, the south east and the midlands. This great Lady GaGa Tribute Act is available throughout Wales including Brecon, Hay-on-Wye, Glamorgan, Cardiff, Swansea, Monmouthshire, Monmouth, Newport, Chepstow , Montgomeryshire, Newtown, Welshpool and Llanidloes. Our Lady GaGa Tribute is also available in Europe including Austria, Belarus, Belgium, Bosnia and Herzegovina, Bulgaria, Croatia, Czech Republic, Denmark, Estonia, Finland, France, Germany, Greece, Hungary, Iceland, Ireland, Italy, Jersey, Latvia, Netherlands, Norway, Poland, Portugal, Romania, Russia, Serbia, Slovakia, Slovenia, Spain, Sweden, Switzerland, Turkey and Ukraine. And finally you can even book this act for the USA, South Africa, Canada, South America, Brazil, Bermuda and anywhere else you can think of !